On Saturday, April 1, Mark Stone and the Dirty Country Band will release their latest studio endeavor, a compelling new EP entitled ‘Trifecta.’ The aptly-titled collection of songs will mark the band’s third release since its inception in 2012 as Stone’s own solo project. A release party is scheduled in Minneapolis the day of the EP’s debut. Since the band has been completed by the addition of Todd Jameson on bass and Johnny Strutt on drums, they have played venues like SXSW and the Moondance Jammin Country Fest. ‘Trifecta’ was recorded at Undertone Studios Inc. with Tom Hambleton, and will be distributed via Ditto Music to all major digital music platforms, alongside physical copies available at the release party. Music is adventure, a journey, or a passage back into time. The journey that Mark Stone and the Dirty Country Band takes you on is one of the most enjoyable you will ever want to hear if you like a band who can play a diverse array of southern country-rock music. 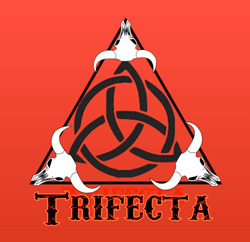 Looking back in time I actually enjoy listening to the songs on “Trifecta”, as I did the songs of The Marshall Tucker Band or the Allman Brothers. Standing tall playing his guitar Mark Stone is a fine player, with great musicians playing alongside with him. This is what gives the band a head-start and their visceral core sound. On this EP, Mark Stone and the Dirty Country Band prove that they can mix it with some of the best southern country rockers. Stone meshes together flavors of rock, soul, blues and country like the Allmans or Skynyrd did, but Mark Stone and the Dirty Country Band put a little more country into some of their songs. Though you wouldn’t say so listening to the down and dirty grooves of “Kickin Up Dust”, which even recalls the bone-crushing swamp blues of ZZ Top. But a flip of the switch will take you to “Never Drinkin Again”, where the country twang is clearer and stronger. Here the band captures the down home country sound through great storytelling lyrics, some awesome vocals, and even some slide guitar. The performance is excellent, with a nice balance between the instrumental parts and the vocals. 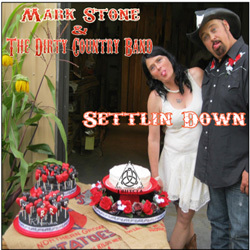 On “Settlin’ Down”, Mark Stone and the Dirty Country Band kick up a gear again, and transit towards upbeat Skynyrd-like guitar riffs. The song gushes with all of the band’s infectious energy, as it breathes new life into the tried and trusted roots musical formula. Surely this band has to be in everyone’s top 10 list of the underground southern, country-rock genre! Contact Mark Stone and the Dirty Country Band!